At Bolt Burdon Kemp, we understand that motorcycle accidents are unique. The injuries sustained and financial losses, including damage to bikes and gear, require a particular approach. We have a dedicated and highly experienced team of solicitors who deal specifically with motorcycle accident claims. We are recognised as one of the leading firms in this area by the independent guides, Chambers and Partners and The Legal 500. Our track record in dealing with motorcycle accident compensation claims means that we can deal with your case efficiently and secure the best possible result. Motorcycling is unsurprisingly a very popular means of travel. In addition to its financial and time saving benefits, it can also be an exhilarating way to get around. Unfortunately, however, motorcyclists are amongst the most vulnerable of all road users. When involved in road traffic accidents, motorcyclists have little protection and can often suffer severe long-term injuries. Our specialist team of solicitors have extensive experience in helping injured motorcyclists who have suffered the most serious injuries including head and brain injuries, spinal injuries, amputations, multiple broken limbs and also fatalities. Get in touch with a member of the team today if you would like to discuss a claim. What are the causes of motorbike accidents? If the person that caused your accident could not be traced or was not insured, you may still be able to claim compensation from the Motor Insurers’ Bureau (MIB). All motor insurance policies contribute to this government fund, which covers hit and run accidents and also collisions caused by uninsured drivers. documentary evidence of these, in the form of receipts, invoices, tickets etc. We appreciate that where a serious injury has been suffered it won’t be possible for details to be obtained or photos to be taken. So we can gather this information for you. Once we have notified the other party’s representatives of your claim, liability for the accident may subsequently be admitted. This means that the other party admits that they were responsible for the accident occurring. However, in the event that liability is disputed, we will gather together as much evidence concerning your claim as possible, such as CCTV footage, the police report and witness statements in order to prove your case. Motorcyclists are legally obliged to wear a crash helmet. Failure to do so may result in the motorcyclist being found to have contributed to the subsequent injury, and this would generally mean an argument by the other driver for a reduction in compensation. Compensation may also be reduced where it is established that the motorcyclist’s helmet was incorrectly fastened. Motorcycles have the ability to accelerate much faster than cars and they require a greater stopping distance. Therefore, partial fault may also be alleged where the collision occurred whilst the motorcyclist was travelling too fast. This may even be the case when the motorcyclist was travelling under the speed limit, but still too fast for the road conditions. For example, there may have been a sharp bend in the road or visibility may have been poor. It may also be alleged that a motorcyclist contributed to an accident whilst overtaking stationary lines of traffic. Whilst motorcyclists are permitted to filter through slow moving traffic, they must look out for vehicles changing lanes or emerging from side roads. It is our job to counter these arguments for you wherever possible so as to maximise your compensation. In the event that the opposition alleges that they were not at fault or that you were partially to blame for the accident, we will advise you accordingly and where possible we will counter the opposition’s allegations so that you still receive as much compensation as possible. 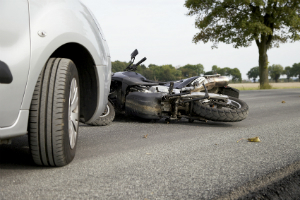 There are various types of compensation that can be sought following a motorcycle accident. The ultimate aim will be to put you back into the position you would have been in had the accident not occurred. Should you require treatment in order to assist you in your recovery, our specialist team of solicitors are skilled in obtaining early interim payments from the other side in order to fund any treatment required. We recognise the importance of early rehabilitation to help you recover from your injuries as soon as possible.